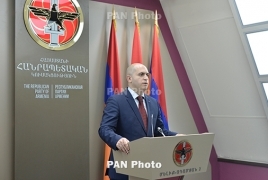 PanARMENIAN.Net - Armenia is expecting not only financial aid from the European Union, but also political help for addressing a number of issues, head of the National Assembly’s foreign relations committee Armen Ashotyan told a forum on Saturday, July 15. “For a long time, there were some stereotypical opinions with respect to Armenia’s relations with the European Union, which suggested that the bloc is kind of an ATM, a financial donor for us,” Ashotyan told the members of the Armenian National Platform of the Eastern Partnership Civil Society Forum. “We are expecting not only money, but also political support in a number of issues, beginning from the Armenian-Turkish relations to the Nagorno Karabakh conflict,” Aravot.am cited him as saying. Earlier, the EU envoy to Armenia Piotr Switalsky commented on the parliamentary elections held in the country on April 2. He said the Electoral Code needs to be changed to include civil society representatives and weighed in on the efficiency of the voting system. The Republican party, in return, urged the envoy against meddling in the country’s internal issues. Switalsky later said that if the European Union’s assistance is no longer desirable, it won’t impose its presence in Armenia.